We have created a simple method of savings that will help you Create A $255 Christmas Fund In Just 15 Weeks! It is hard to believe that Christmas is just around the corner. As many of us struggle to make ends meet, the holidays can but a real strain on your budget. While this can be a bit tough for some, we have a lot of suggestions on how to make it work for your family. This last minute savings plan can provide your kids with a few great gifts this year for Christmas. Plus we have a fun Free Printable Christmas Fund Savings Schedule that is sure to help you stay on track during the busy holiday season. CREATE A $255 CHRISTMAS FUND IN JUST 15 WEEKS! This process is simple. Simply begin in the first week of September and put aside $25 per week for 15 weeks. You are asking how to make $25 appear in your budget? Here are some simple ways to save a few extra dollars each week to put toward this fund. Take your lunch to work instead of going out to eat. These are just a few simple ways you can save or make a little extra money during this time to put into your Christmas Fund. The plan is simple. Start by putting $10 into your fund the first week and increase that amount by only $1 per week for 15 weeks. If you start the first week of September, by the end of the first week of December you will have saved $255. While that doesn’t seem like a ton of money, it is a great amount to buy a large family gift like a game console, or to add one extra nice gift under the tree for each family member. 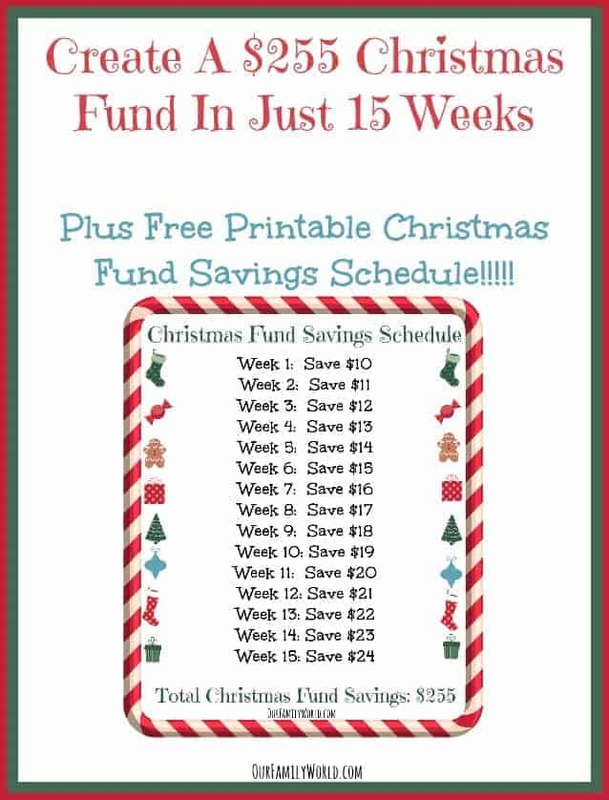 To help you keep track of how much to put aside each week, make sure to grab our FREE Printable Christmas Fund Savings Schedule. Print a few copies and post on your desk, refrigerator or wall in your office. It is easy to create a $255 Christmas Fund in just 15 weeks if you follow these simple tips! Do you have any other ideas for how to start your Christmas Fund and save money for the holidays? This is awesome, I love finding ideas like this on the internet. I will be doing this to try and save for Christmas, thank you. I love this idea I remember when I was younger they used to have the “Christmas Club” at banks where you would put away a little bit every week and they would not give the money to you until right before Christmas! That’s a great list for saving money. I also try to clip coupons and bulk buy items on sale to save money.